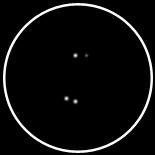 COMMENTS: This one appears to be a "Double Double" like Epsilon Lyrae. 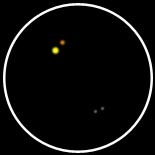 The brightest star is yellow in color, while its dimmer companion appears orange when viewed out of focus. 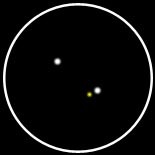 The double to the south has two stars equal in magnitude with no color. COMMENTS: This one is another "Double Double". This pair of doubles has more variety in magnitude than Epsilon Lyrae though. The northern most double contains the brightest star. No color, but white, can be distinguished under the present seeing conditions. COMMENTS: The brilliant primary is white. The secondary is half the magnitude of the primary and blue in appearance when shifted out of focus. COMMENTS: Primary is a "sharp" golden-yellow. Secondary is also yellow, but darker than the primary. COMMENTS: The primary star is bright yellow. The secondary, after closer examination, was discovered to be a close binary system in its own right. Color was difficult to distinguish, but seemed a dark yellow. COMMENTS: These two are nearly identical in color; both are yellow. The primary is about a magnitude brighter than the secondary. COMMENTS: The two brightest stars in the eyepiece are identical in magnitude. However, 17 Draconis has a faint yellow companion. Very tricky! COMMENTS: This is the closest association I have observed thus far. The two are absolutely equal in magnitude. They appear to be white. COMMENTS: The brightest star of this pair is golden-yellow. At first glance it appeared that the fainter companion was also yellow, but it took on a white hue at higher magnifications. COMMENTS: The brilliant primary star of this system is bright white. The faint companion is either red or deep orange. It was difficult to tell under the seeing conditions.